You answer, only to be met with silence, a pre-recorded message saying how you’ve won some great cruise, or a solicitor on the other end of the line. Thirty seconds of your time was wasted on this call while other phone lines light up with real callers needing assistance. Unfortunately, it’s become all too common these days. Spam calls and fake calls are a real nuisance—on personal and business phone lines. Are you tired of getting bombarded with calls that do not have a positive impact on your business? How can you deal with spam callers and reduce telemarketers and fake numbers from calling your business? What to do about spam calls – and what are they? A “spam call” is a more universal term of any type of unwanted call coming into your phone line(s). Spam calls may include robocalls, solicitor calls, fake calls, spoofed calls, and more. Of all the call complaints that were reported to the FCC in 2017, about 63 percent were robocalls. 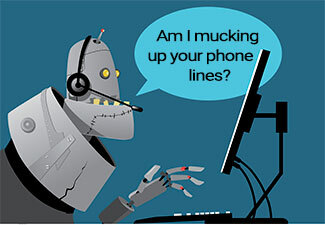 Robocalls are automated telephone calls that go through lists of numbers and deliver a recorded message to your phone, either legally or illegally. These calls are typically made with an autodialer, using a prerecorded or artificial voice. The technology to make these calls is very cheap and easy to acquire, which is why the practice is running rampant. The companies producing these illegal phone calls are usually looking to phish information and use it for nefarious purposes. What is phone number spoofing? Some robocallers can even mask their numbers; this is called spoofing. Spoofing makes the call look like it is coming from a different phone number than it is. With number spoofing, you may see a particular phone number calling you – but that is not the true origin of the placed call. The real number is hidden by the spoofed phone number. If you call back a spoofed phone number, you won’t reach the original caller – since the spoofer masked the real phone number with a different, perhaps real, phone number. Ever have someone call your phone, saying that you called them when you know that you didn’t? You may have been a victim of having your number spoofed. The FCC is working to battle these callers’ invasions of our privacy, but that is an ongoing process. You’ve probably even noticed more and more spam calls from phone numbers that are alarmingly similar to your personal or business phone number that is being called. This practice is called neighborhood spoofing. The spoofers try to elicit trust in the phone number by making it a local number so that you may be more prone to answering the call. How can I get rid of spam calls and fake calls at my business? While a perfect solution to block 100% of these calls does not exist, there are a few options at your disposal to help reduce the number of fake and spam calls you receive. If getting copious spam calls to your cell phone is an issue, there are options available in the form of a simple phone app. Both Apple and Android users can find apps to aid in blocking nuisance calls to their cell phone. Most apps are free, but some may require access to your entire phone contacts list, so choose which app sounds right for you. After downloading your selected app, you will have to enable them through your phone for them to work. Make sure to contact your phone provider for more information if you need help enabling your third-party app on your phone for spam blocking. The good ol’ “Do Not Call” list. The FCC created this, and yes, it’s still around. While this works most of the time as a way to get solicitors and telemarketers to stop calling your business, there are still illegal calling practices happening from people who frankly do not care about the FCC rules. You may remember the days of yelling at telemarketers to add your house line to this list, and you can still do so today with your business or cell phone number, too. Adding your number(s) to the do not call list and filing a complaint with the FCC can help alleviate some of those pesky calls you are getting to your land and mobile lines, but unfortunately, it doesn’t work for them all. Most phone carriers (including CallSource) can easily give you the ability to block specific phone numbers from calling your phone lines. Verizon, AT&T, Sprint, T-Mobile, and other major carriers have their own ways to enable call-blocking for you on mobile or landlines. Besides the ability to block specific phone numbers, CallSource will also allow you to block all phone calls coming from specific area codes. While this is an easy way to rid numbers that seem to be calling you over and over (and no, I’m not recommending you use this on your Aunt Linda who calls too often—but that choice is yours), it isn’t an effective solution for the aforementioned robodialers who are spoofing phone numbers. A spoofed phone number isn’t the actual number being called from, so blocking these numerous random numbers that are reaching to you won’t do much when they are calling from a different spoofed number next time. Blocking spam calls from reaching you may be a good short-term solution for specific phone numbers that are dialing your phone over and over again. Keep in mind, this may work better for telemarketers and sales calls that are not masking their phone number, but it can help alleviate too many pesky calls from reaching your business. CallShield is a proprietary IVR (Interactive Voice Response) solution built by CallSource. It is used to combat these calls such as robocalls and spoofed numbers. CallShield is used to literally “shield” against fake, spam, and robocalls. CallShield is automatically activated on of CallSource’s tracking numbers – whether toll-free, local, or custom phone numbers – for no additional fee. Although clients can decide to opt-out of this service, all CallSource telephone numbers are ensured to include this proprietary spam blocking solution. When auto-dialers and other possible spam calls are confronted with the CallShield IVR, they are disconnected since their technologies cannot comply at the correct moment. CallSource is the only call tracking company that blocks fake calls in this way. CallShield listens for specific audio queues that are uniform for spam or robocalls. From there, if a call is suspected not to be legitimate, CallShield deploys a prompt for the caller to identify if they are a real person. If not, then the call will be dropped and obviously not able to connect through to your actual phone line. It is as simple as that. How can I do this on my own? You can also manually turn on an IVR menu for calls at your business as well – that is your decision. By deploying an IVR menu on your business phones, a message will play on every single call to your office, while CallShield only plays automatically when a spam call is detected. It is up to your discretion as a business owner whether you want all callers, or only those believed to be spam, to reach an IVR menu and have to take action by pressing keys on their telephone pad. How do spam and fake calls affect my call tracking data? If your business is not currently protected from spam and fake calls, this may impact your call tracking data. Some advertising companies promise to bring you a specific amount of calls or leads by advertising with them. If any of your ad tracking phone numbers are getting bombarded with fake calls, this will greatly skew your data. Make sure that you use your own call tracking for the extra security to see from your own data how well all of those ads are truly performing. 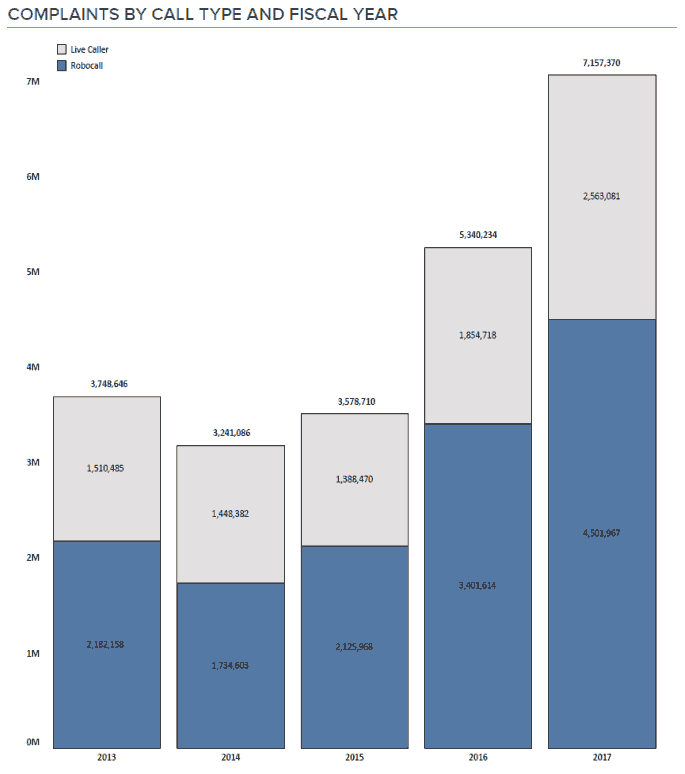 If your call tracking provider gives metrics around the types of calls coming in, look at those reports. If you have basic call tracking without additional metrics, listen to calls to see what is happening, and pay attention to conversation lengths. Want to learn more about how CallShield can help your call management by reducing the number of fake and spam calls at your business? Click here to have someone reach out to you, or contact a representative today at 888.788.0123 to learn more. I want to talk to someone about protecting my business from spam calls. I have a marketing business that is using a call tracking service. Only problem is it doesn’t have several call tracking numbers that are assigned to my clients ads and they are getting overwhelmed with spam callers. It doesn’t provide true ROI and it’s wasting there time. Plus it makes me look bad when all there getting is spam calls. I’d like to know more about your services and if there’s the ability to resell the product to my clients and new. Thanks so much for your comment; we are glad to help! A rep should be reaching out to you shortly to discuss in further detail. Thanks for your interest – I’ve forwarded your info over and a representative will be contacting you to discuss. Have a great day! I’m sorry; that sounds frustrating! Sounds like telemarketers are causing you to potentially lose valid leads as well. If you’d like to hear about our spam-blocking solution, let me know if you’d like to have a representative reach out, or feel free to contact us at 833-YOUR-SOURCE (888-357-0354) or sales@callsource.com. My name is Shaterra Wyatt; I am the receptionist here at Excelerate Energy located in The Woodlands, TX. We are receiving excessive robot-callers that call every minute. Can you please let me know how I can block robot callers from our business lines? I’m sorry to hear that robo-callers are interrupting your regular calls so often! You can always reach out to your phone carrier to see what solutions they have for you. I’ll also let one of our representatives know that you are having this issue; they will reach out to you to let you know more about our spam-blocking solution, CallShield.